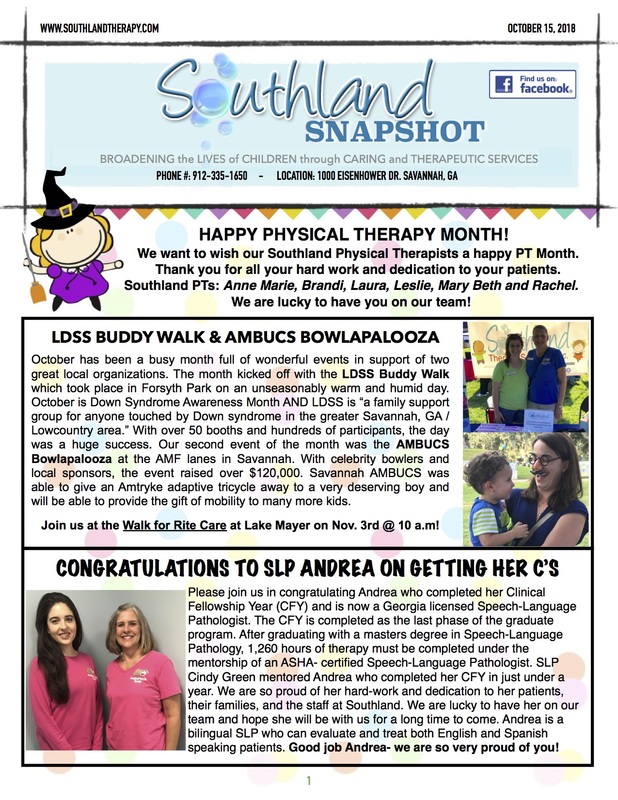 Southland Snapshot: Happy PT Month, LDSS Buddy Walk and new Therapists - Southland Therapy Services, Inc.
We want to wish our Southland Physical Therapists a happy PT Month. Thank you for all your hard work and dedication to your patients. Southland PTs: Anne Marie, Brandi, Laura, Leslie, Mary Beth and Rachel. We are lucky to have you on our team! October was a busy month full of wonderful events in support of two great local organizations. The month kicked off with the LDSS Buddy Walk which took place in Forsyth Park on an unseasonably warm and humid day. October is Down Syndrome Awareness Month AND LDSS is “a family support group for anyone touched by Down syndrome in the greater Savannah, GA / Lowcountry area.” With over 50 booths and hundreds of participants, the day was a huge success. Our second event of the month was the AMBUCS Bowlapalooza at the AMF lanes in Savannah. With celebrity bowlers and local sponsors, the event raised over $120,000. Savannah AMBUCS was able to give an Amtryke adaptive tricycle away to a very deserving boy and will be able to provide the gift of mobility to many more kids. Join us at the Walk for Rite Care at Lake Mayer on Nov. 3rd @ 10 a.m! 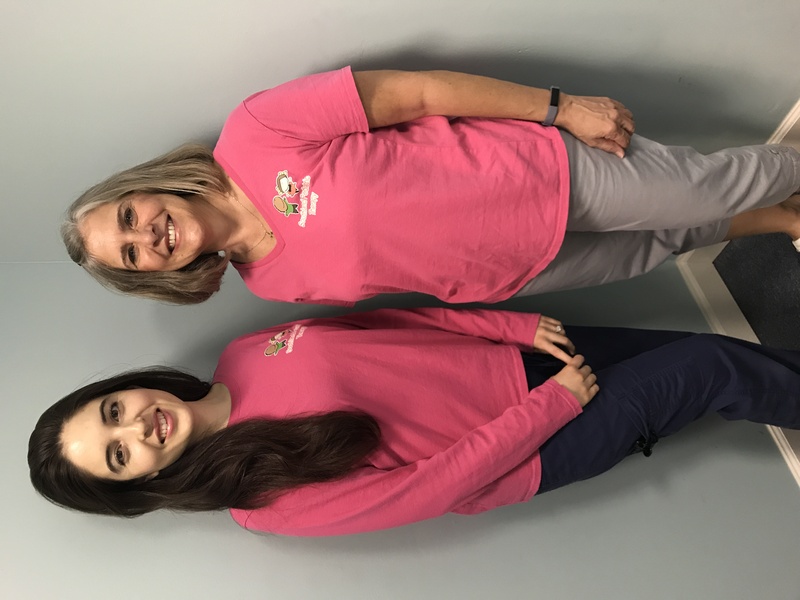 Please join us in congratulating Andrea who completed her Clinical Fellowship Year (CFY) and is now a Georgia licensed Speech-Language Pathologist. The CFY is completed as the last phase of the graduate program. After graduating with a masters degree in Speech-Language Pathology, 1,260 hours of therapy must be completed under the mentorship of an ASHA- certified Speech-Language Pathologist. SLP Cindy Green mentored Andrea who completed her CFY in just under a year. We are so proud of her hard-work and dedication to her patients, their families, and the staff at Southland. We are lucky to have her on our team and hope she will be with us for a long time to come. Andrea is a bilingual SLP who can evaluate and treat both English and Spanish speaking patients. Good job Andrea- we are so very proud of you! Rossana received her Master’s degree in Clinical Audiology and Speech-Language Pathology from Pontifical Catholic University, in Brazil. She also participated in 2-year post-graduate specialization programs: one in Orofacial Myofunctional Therapy and another in Public Health. She moved from Brazil to Seattle, WA, U.S. in 2012 and since 2016 has called Savannah home. 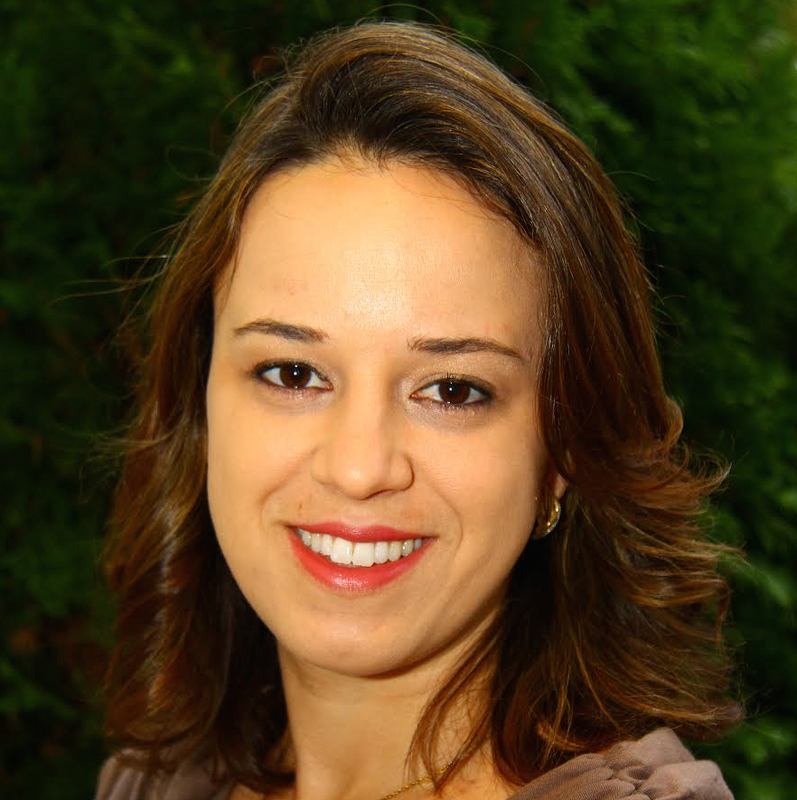 Rossana has over 16 years’ experience and is a specialist in the area of Orofacial Myofunctional Therapy (OMT). Her main focus as a professional is to provide individualized treatment and customized therapy with a team work approach when applicable. She has extensive experience working with clients with oral motor, normal and abnormal orofacial/craniofacial development and function, and orofacial functional disorders associated with incorrect swallowing patterns (known as tongue thrust), feeding disorders, mouth breathing, abnormal sucking habits, syndromes, cerebral palsy, craniofacial abnormalities like cleft lip and palate, tongue/lip-tie and dental malocclusion, and articulation and speech disorders. Rossana is fluent in English and Portuguese, and is working on her Spanish. Jennifer is originally from the Pacific Northwest. She earned her degrees in Communication Sciences and Disorders from Western Washington University in Bellingham, Washington. Jennifer has lived in Savannah for over a decade and is married with a preschool-aged son. She has been practicing speech therapy for over 15 years. 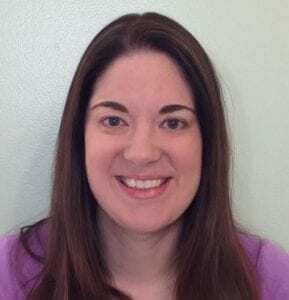 She specializes in the treatment of apraxia of speech and autism-related language disorders. In her spare time, Jennifer enjoys camping, reading, and crocheting. She is very excited to be a part of the Southland team! 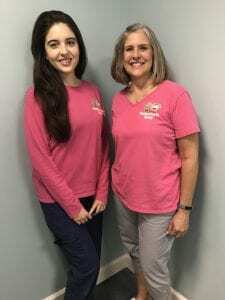 What is Orofacial Myofunctional Therapy (OMT) and what problems does it help? OMT is neuromuscular re-education that aims to achieve adequate orofacial muscular patterns for optimal functioning of breathing, chewing, suctioning, swallowing, speech, and even sleeping. Orofacial myofunctional intervention includes behavior modification techniques and orofacial myofunctional exercises to improve the strength, tone, mobility and/or coordination of orofacial structures (tongue, lips, cheeks, pharynx and jaw), focusing on the airway, rest posture and oral awareness (RAMIRES, McCORMICK, 2014). Is someone you know currently experiencing incorrect swallowing patterns? Examples include: tongue thrust, mouth breathing, oral habits such as thumb sucking, excessive pacifier use or nail biting, tongue and/or lip-tie, oral-motor dysfunction, drooling, cleft lip and/or palate, sleep disorder breathing, dental malocclusion or feeding/ swallowing disorders. Southland has skilled therapists that can evaluate to determine if surgery, additional therapies or referrals are necessary. 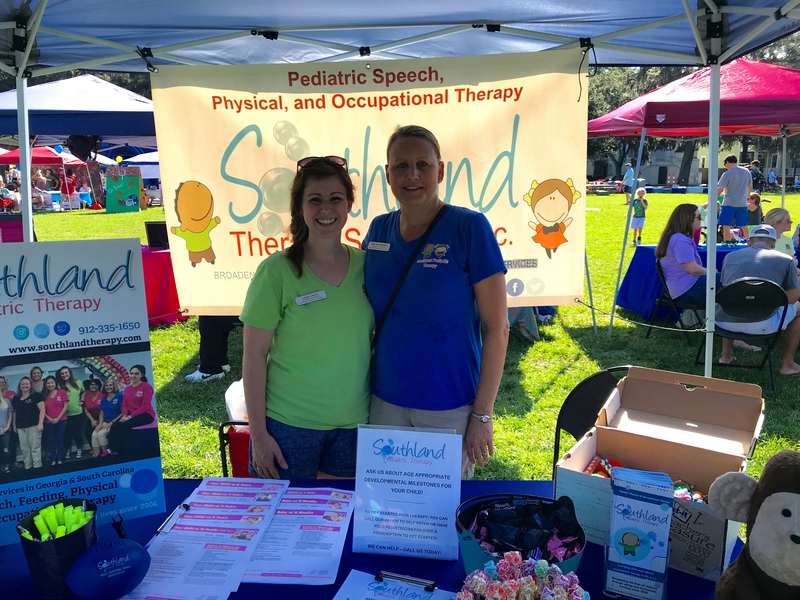 Southland’s wonderful relationship with local area pediatricians, lactation consultants, pediatric dentists and ENTs allow our therapists to build a comprehensive team and provide a thorough plan to assist your child on their speech journey.